The New Mexico Cancer Council is a public/private partnership working to reduce the burden of cancer in New Mexico. 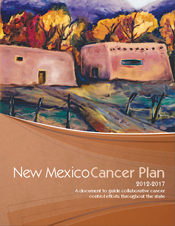 The New Mexico Cancer Council is a collaborative effort of diverse public and private partners working together to attack cancer in New Mexico through the development, implementation and evaluation of the New Mexico Cancer Plan. Our goal is to increase access to information, prevention and treatment using innovative and effective programs and policies thus reducing the human and economic burden of cancer and improving the outcomes and quality of life for New Mexicans. What does the New Mexico Cancer Council do? To provide an overview of the current status of cancer in New Mexico. To develop strategies to reduce overall cancer incidence and mortality. To provide a forum for communication of cancer-related issues and activities among community groups. To provide an improved quality of life for those affected by cancer in New Mexico. Who can join the New Mexico Cancer Council? Membership is open to any organization or person who is interested in reducing the burden of cancer in New Mexico. An Executive Committee oversees achievement of the New Mexico Cancer Plan’s goals and objectives, and serves as the decision-making body of the New Mexico Cancer Council. The Cancer Council’s growing membership includes organizations and individuals who represent diverse professions — all of whom are concerned with alleviating the burden and suffering cancer causes in New Mexico. Constituencies include patient care, research, emotional support services, education, advocacy and policy and media. In addition, the Cancer Council acts in an advisory capacity to the Executive Committee. Workgroups may be formed as appropriate to address specific issues.